Impaired Urinary Elimination is a too general diagnosis for effective clinical use; yet, it is clinically helpful until further data can be obtained. With more data, the nurse can further view a specific diagnosis, such as Stress Urinary Incontinence, whenever possible. 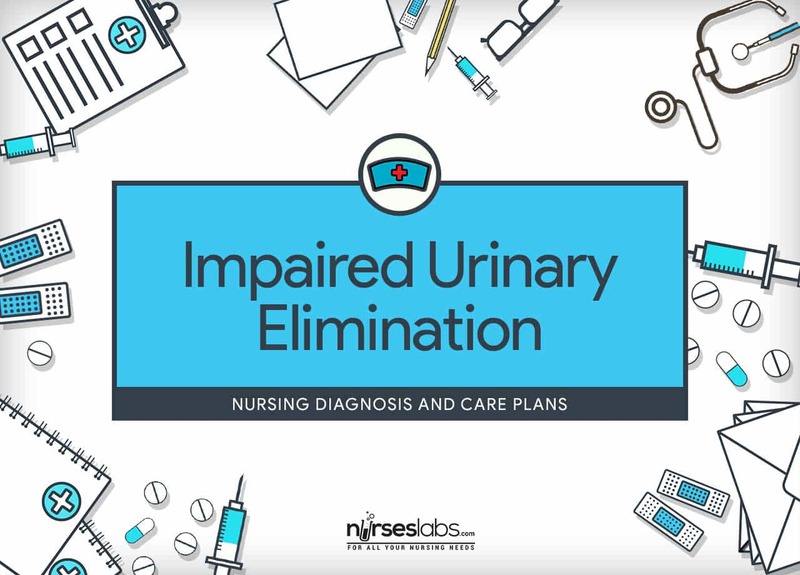 In general, the nurse can write Impaired Urinary Elimination related to unknown etiology when the etiologic or contributing factors for incontinence have not been recognized. Patient demonstrates behaviors and techniques to prevent retention/urinary infection. Patient identifies the cause of incontinence. Patient maintains balanced I&O with clear, odor-free urine, free of bladder distension/urinary leakage. Patient provides rationale for treatment. Patient verbalizes understanding of the condition. Focus assessment is necessary in order for the nurse to determine whether incontinence is transient, in response to an acute condition, or established in response to various chronic neural or genitourinary conditions. Assess voiding pattern (frequency and amount). Compare urine output with fluid intake. Note specific gravity. Identifies characteristics of bladder function (effectiveness of bladder emptying, renal function, and fluid balance). Note: Urinary complications are a major cause of mortality. Palpate for bladder distension and observe for overflow. Bladder dysfunction is variable but may include loss of bladder contraction and inability to relax urinary sphincter, resulting in urine retention and reflux incontinence. Note: Bladder distension can precipitate autonomic dysreflexia. Note reports of urinary frequency, urgency, burning, incontinence, nocturia, and size or force of urinary stream. Palpate bladder after voiding. This provides information about degree of interference with elimination or may indicate bladder infection. Fullness over bladder following void is indicative of inadequate emptying or retention and requires intervention. Review drug regimen, including prescribed, over-the-counter (OTC), and street. A number of medications such as some antispasmodics, antidepressants, and narcotic analgesics; OTC medications with anticholinergic or alpha agonist properties; or recreational drugs such as cannabis may interfere with bladder emptying. Assess the availability of toileting facilities. Patients may need a bedside commode if mobility limitations interfere with getting to the bathroom. Assess the patient’s usual pattern of urination and occurrence of incontinence. Many patients are incontinent only in the early morning when the bladder has stored a large urine volume during sleep. Begin bladder retraining per protocol when appropriate (fluids between certain hours, digital stimulation of trigger area, contraction of abdominal muscles, Credé’s maneuver). Timing and type of bladder program depend on type of injury (upper or lower neuron involvement). Note: Credé’s maneuver should be used with caution because it may precipitate autonomic dysreflexia. Encourage adequate fluid intake (2–4 L per day), avoiding caffeine and use of aspartame, and limiting intake during late evening and at bedtime. Recommend use of cranberry juice/vitamin C. Sufficient hydration promotes urinary output and aids in preventing infection. Note: When patient is taking sulfa drugs, sufficient fluids are necessary to ensure adequate excretion of drug, reducing risk of cumulative effects. Note: Aspartame, a sugar substitute (e.g., Nutrasweet), may cause bladder irritation leading to bladder dysfunction. Observe for cloudy or bloody urine, foul odor. Dipstick urine as indicated. Signs of urinary tract or kidney infection that can potentiate sepsis. Multistrip dipsticks can provide a quick determination of pH, nitrite, and leukocyte esterase suggesting presence of infection. Promote continued mobility. This decreases risk of developing UTI. Cleanse perineal area and keep dry. Provide catheter care as appropriate. Proper perineal hygiene decreases risk of skin irritation or breakdown and development of ascending infection. Recommend good hand washing and proper perineal care. Handwashing and perineal care reduce skin irritation and risk of ascending infection. Refer to urinary continence specialist as indicated. Collaboration with specialists is helpful for developing individual plan of care to meet patient’s specific needs using the latest techniques, continence products. Oxybutynin (Ditropan), propantheline (Pro-Banthine), hyoscyamine sulfate (Cytospaz-M), flavoxate hydrochloride (Urispas), tolterodine (Detrol). These drugs reduce bladder spasticity and associated symptoms of frequency, urgency, incontinence, nocturia. Catheterize as indicated. Catheterization may be necessary as a treatment and for evaluation if patient is unable to empty bladder or retains urine. Teach self-catheterization and instruct in use and care of indwelling catheter. This method helps patient maintain autonomy and encourages self-care. Indwelling catheter may be required, depending on patient’s abilities and degree of urinary problem. Obtain periodic urinalysis and urine culture and sensitivity as indicated. These tests monitor renal status. Colony count over 100,000 indicates presence of infection requiring treatment. Nitrofurantoin macrocrystals. (Macrodantin); co-trimoxazole (Bactrim, Septra); ciprofloxacin (Cipro); norfloxacin (Noroxin). Bacteriostatic agents inhibit bacterial growth and destroy susceptible bacteria. Prompt treatment of infection is necessary to prevent serious complications of sepsis/shock. Monitor BUN, creatinine, white blood cell (WBC) count. These reflect renal function and identify complications. Keep bladder deflated by means of indwelling catheter initially. Begin intermittent catheterization program when appropriate. Indwelling catheter is used during acute phase for prevention of urinary retention and for monitoring output. Intermittent catheterization may be implemented to reduce complications usually associated with long-term use of indwelling catheters. A suprapubic catheter may also be inserted for long-term management. Measure residual urine via postvoid catheterization or ultrasound. Measuring residual urine via postvoid catheterization or ultrasound is helpful in detecting presence of urinary retention and effectiveness of bladder training program. Note: Use of ultrasound is noninvasive, reducing risk of colonization of bladder. Refer for further evaluation for bladder and bowel stimulation. Clinical research is being conducted on the technology of electronic bladder control. The implantable device sends electrical signals to the spinal nerves that control the bladder and bowel. Early results look promising. Teach Kegel exercises. These exercises improve pelvic floor muscle tone and urethrovesical junction sphincter tone. Educate patient about the importance of limiting intake of alcohol and caffeine. These chemicals are known to be bladder irritants. They can increase detrusor overactivity.